If you are looking for drought tolerant reliable flowering plants then Penstemon would be on the list. These are generally a very long and also late flowering group of plants which makes them an even more valuable addition to the garden border. Penstemon plants, varieties and flowers are widely used in perennial borders and cottage gardens. Penstemon barbatus is an evergreen species, P. Port Wine, P.’Blackbird’ and the pink flowering P. “Yvonne” are popular species and cultivars. Penstemon are originally from North America and Asia, however penstemon have been widely hybridised over the years. 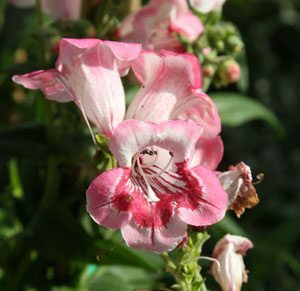 Penstemon seeds are available from some nurseries. The great thing about these plants is that some, such as the red foliaged ‘Huskers Red’ is that some have great foliage as well as good flowers. Height will vary from tall varieties that will reach over 1m such as ‘Mother of Pearl’ to lower growing types to 60 cm such as ‘Peace’. Penstemon are really a drought tolerant plant one established. Plant in a humus rich well drained soil with plenty of sun. They will flower from spring through to autumn with a little care. It is this long flowering nature that makes them such valuable additions to the cottage garden. Water newly planted penstemon while they establish a root system, after this the only maintenance required will be cut back during winter and to divide if they become over crowded. All species provide a colourful display in summer months. All require a well drained humus rich soil and although they will grow in part shade they will not flower as well as when in full sun. Penstemon plants can be propagated by division, or from seed. Propagation from divisions easy and be carried out in late winter. Simply dig the clump, divide into sections with shape secateures making sure a good section of the roots is attached to each section. It is a good idea to dig and divide Penstomon plants every 4 years to maintain vitality and vigour. Replant in a humus rich well dug soil. From seed you can either sow directly to the garden or start the seeds of in a propagation try. Seeds are best sown after the danger of frosts has past. Sow the seeds in trays using a fine seed raising mix. Cover lightly and keep moist. Using a heated propagation tray will speed up germination. Usually the seeds will germinate within 14 days. A low rosette will form first and then a flower stalk much later. The seedling should be grown on for 4 – 6 weeks after germination before planting out. ‘Firebird’ – Red flowers to 80 cm in height. ‘Russian River’ – Very attractive purple flowers. After the first flush of flowers you can prune lightly. In spring remove the older woody stems as soon as you see new grow beginning from the base of the plant.